An MRI Friday afternoon confirmed a strain of Serge Ibaka's left calf muscle and also revealed the severity of the strain, Grade 2. The recovery time is generally 4 to 6 weeks, it's not a threat to Ibaka's career but the timing of it couldn't be much worse. "The recovery process is is long because of the re-injury possibilities," Thunder GM Sam Presti told reporters during a late Friday afternoon teleconference. "The timing of the injury is the real unfortunate part to this." That's because even if the Thunder make it into the NBA Finals, it's highly unlikely Ibaka could be healed up enough to be able to play. At least the Thunder now have some experience in dealing with unexpected setbacks because of injuries. "We have had contributions across the board during the season and we think this is the most fully formed team we've had," Presti noted. "We're more prepared now to deal with this. We've been dealt unexpected circumstances before and Scott (Brooks) and our coaching staff's done an excellent job in developing the roster." Last season, also in the playoffs, Russell Westbrook went down with his knee injury and then went down again earlier this season with problems in that same knee. The Thunder also lost Thabo Sefolosha for about five weeks with a strained calf muscle and Kendrick Perkins went down for about a month too with a strained groin. During those times the Thunder brought in young guys who gained valuable experience. Steven Adams started for Perk and has been a force at times in these playoffs, especially in Game 6 against the Clippers. Andre Roberson filled in some games for Thabo. 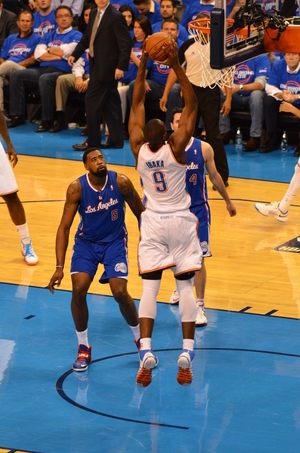 Ibaka was having his best season ever and in the four regular season games against the Spurs in 20-13-14 he averaged a double-double with 14.3 points and 11.5 rebounds. He also averaged four blocks and shot 46 percent, so he will be sorely missed. His defense on Tim Duncan and Tiago Splitter was also tremendous this season and it gave the Thunder perimeter defenders more confidence on aggressively closing out on Spurs' shooters because Ibaka was back there protecting the paint. A lot of things will change but the Thunder have shown they can adapt to adversity as well if not better than any team in the NBA and so now they will have yet another opportunity to show how resilient this group can be.